Metaverse adopts a swap service to implement the cross-chain swap between Ethereum ERC20 tokens and Metaverse MST. User create Avatars on Metaverse blockchain. With the data of user’s Avatars, the contract linked with Metaverse address is executed to link Ethereum with their Avatars on Metaverse. 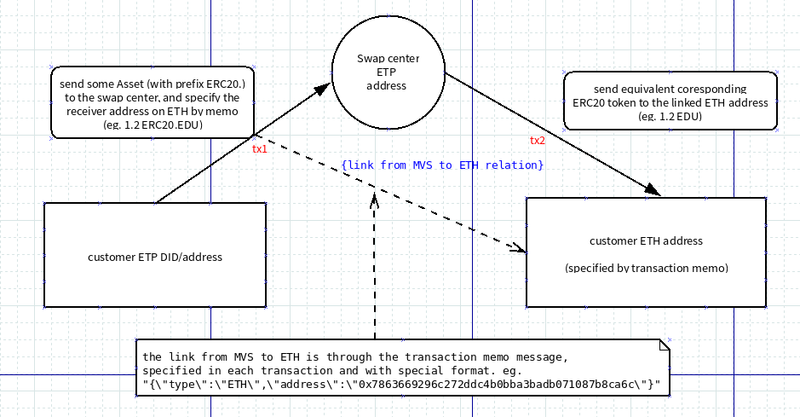 User send the ERC20 tokens to the Ethereum address swapped by the Metaverse MST. The swap service will automatically process the transactions, sending equivalent MST to Metaverse Avatars. User can send the Metaverse MST that can be swapped to the Avatars droplets that manage the swap process on Metaverse side. The swap service will automatically process the transactions, sending equivalent ERC20 tokens on the Ethereum blockchain to the Ethereum address specified by the user. Address Linking Module: to link the Ethereum address to the Avatar of Metaverse. Preprocessing module: to scan different token transactions that need to be swapped. During the scanning process, the main chain, the address and the number of assets of the target transactions will be obtained, while those that do not meet the rules will be filtered. For example, the number of assets is too small, or the type of the target assets isn’t yet supported. Swap module: to initiate a transaction of the same assets from the purposed main-chain address to the target main chain, based on the scanned swap information. Since the transactions of Ethereum ERC20 tokens don’t support additional information, it is necessary to link the Ethereum address with the Avatar or address on Metaverse at first (it is recommended to use an Avatar). We created an address-linked smart contract called ETPMap on the Ethereum public blockchain to support the linking of the Ethereum address and the Metaverse Avatar or address, which also supports to link multiple Ethereum addresses to the same Metaverse Avatar or address. 0xa52b0a032139e6303b86cfeb0bb9ae780a610354, which can be viewed on the Ethereum Block Browser. After the linking, the ERC20 tokens can be sent to the Metaverse swap center from the Ethereum address that have been linked. Thus, equivalent MST assets will be automatically sent to the linked Metaverse Avatar or address. There is no need to link the Metaverse Avatar to the Ethereum address to do a swap from Metaverse to Ethereum, since the recipient Ethereum address can be specified in a message directly in the transaction. The MST asset has to be sent to the Avatar droplet that manage the swap function on the Metaverse public blockchain and contain a message using the json format that contains the target public blockchain type and the wallet address of the target main chain that will be sent to. Currently, this operation is supported on all nodes, light wallets, and mobile terminals. The cross-chain transactions of assets that match the rules can be obtained by scanning the transactions. During the scanning process, the transactions will be verified, including asset type filtering, address verification (Ethereum address, Metaverse address transaction), asset quantity verification, cost verification (‘1 ETP’ to swap Metaverse MST for Ethereum ‘ERC20’ tokens), and third-party node verification. Only the transactions that meet the rules can be swapped. The pre-processed transactions will enter the swap process. In order to prevent a series of problems caused by blockchain forks, each exchange transaction needs to be confirmed by a certain block height. 0xc1e5fd24fa2b4a3581335fc3f2850f717dd09c86, then equivalent MST can be received on the Metaverse Avatar or address. To swap from MST to Ethereum ERC20 tokens, you need to send a transaction with a specific format to the swap Avatar droplet that manage the swap function on Metaverse. 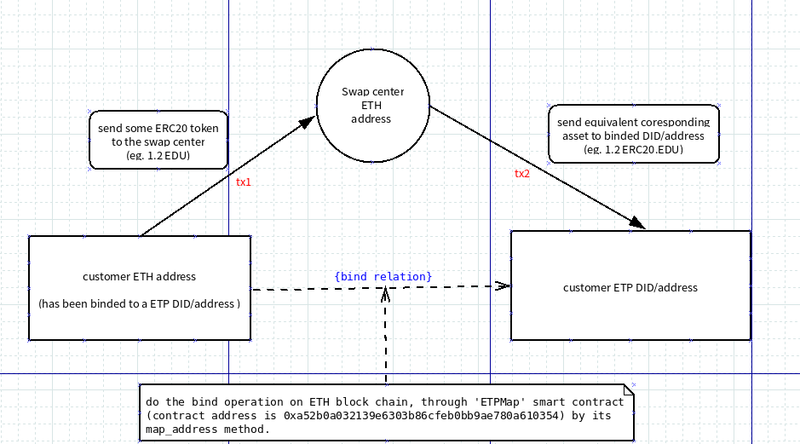 The transaction output will include the type of the target main chain (eg: Ethereum belongs to ETH) and the wallet address on the target chain, which costs 1 ETP as swap fee.